When Siwon Choi walks into the room, it’s as if the magnetic field switches and the lodestars change. An exaggeration? Maybe, but it’s a close call. A room bustling with the click-clacks and chatter of people hanging clothes, setting up lights and taking pictures of the Hong Kong skyline from our set suddenly pauses. Choi is here. One by one, faces light up and the voices of those who are meeting the star for the first time rise in pitch. He takes it all in his stride, strolling around the suite greeting those he already knows by name and others he doesn’t with a smile and a firm handshake. His candour is refreshingly different from the hauteur one expects from someone who’s been in the industry for 13 years. Choi and Super Junior, the 10-piece boy band of which he’s a member, were instrumental figures in the Hallyu wave that swept across the globe. It’s no wonder, then, that the man has 4.7 million followers on Instagram, 6.37 million on Twitter and a staggering 16.4 million on Weibo (that last figure is more than double the population of Hong Kong). 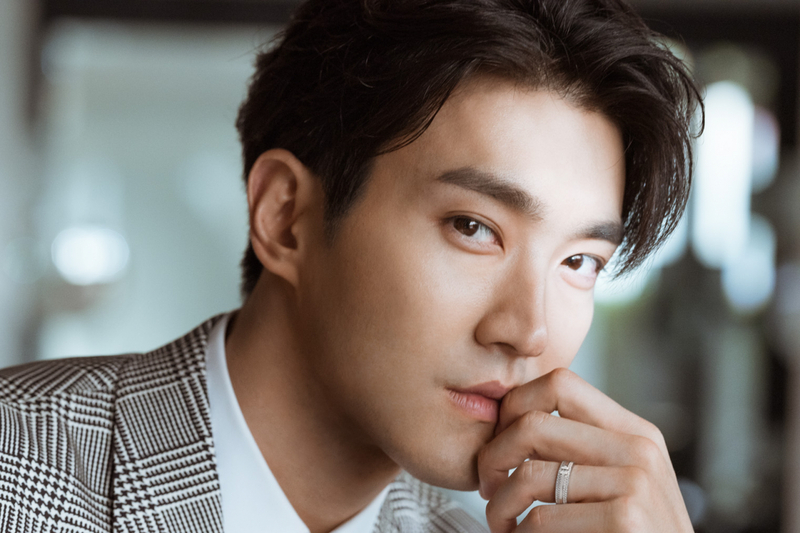 To many, he’s a god, with legions of Super Junior fans – self-named “Elfs”, a tribe unto themselves – and his own subdivision of fandom known as “Siwonests”. Choi’s mix of friendliness and consummate professionalism becomes apparent as the shoot gets under way. He hits all the right angles, checking the screen to see if each shot passes muster and offering to shoot more. “Are you happy with it?” he asks those of us huddled around the display monitor. “I can shoot more if you’d like me to!” After an hour and a half or so, maintaining the pensive smoulder that celebrity features often require, he asks mid-pose, “Can I smile? I’m better at that, I think.” Immediately his crew remarks, “Ippo [pretty],” and it’s clear that those of us who don’t speak Korean are wont to agree. Listening to snatches of conversation with his Korean team, the occasional oppa is dropped into the mix – Korea’s equivalent of the Japanese kawaii. Made popular by the country’s television shows and adopted by hordes of screaming tween and teenage fans at the sight of their favourite boy-band members, it means “big brother” and is used to refer to an actual older brother as well as to address all close older male friends. When I bring this up, I’m met with a sheepish grin. Line Choi’s amiability up against his accomplishments and you’ll understand why it seems so extraordinary. Even before his debut in 2005, he was the first person in Korea to be awarded the fourth row in the black belt for Taekwondo at the age of 14, changing the pre-existing rule that only people aged 18 could be awarded for the achievement. Before being invited to join Super Junior, he was already acting alongside Hong Kong’s Andy Lau. “I wanted to be an actor first,” he says. His is a well-known story, auditioning without his parents’ knowledge and being accepted. The band was created as a collection of the best (hence “Super”) trainees (hence “Junior”) in SM Entertainment’s cohort. “They convinced me to be a singer and I said yes, but I definitely wanted to be an actor,” he says. An actor he definitely has been. Although the group remains a fundamental part of Choi’s career – it’s the reason he’s in Hong Kong this time round, as part of its comeback world tour Super Show 7, performing the band’s first album since 2015 – Choi has always kept a firm foot in acting. It doesn’t come without hard work, though, “When I shot To the Fore, I had to use three languages, English, Mandarin and Korean,” he says. “When they changed my dialogue on set, all the other actors and actresses were fine, because it was their mother language, but in my case it was really hard because it wasn’t my mother language – and even if they had changed the Korean dialogue, I might’ve gotten into some trouble because I want to perform the best that I can, and to do so I need to prepare. It’s a lesson he’s taken to heart and it paid off when he chose to play Kim Shin Hyuk, a happy-go-lucky senior magazine editor, the supporting lead in 2015 hit Korean series She Was Pretty, right before Choi enlisted in the army. He didn’t end up getting the girl in the show’s 16 episodes, but he did leave an untold number of women swooning from what Korean drama discussion boards call “second-lead syndrome” and waiting for his return with bated breath. What is success for Choi? It’s not money, fame or power, I learn, despite the fact that his fans can look forward to a new Super Junior album this year, more concerts, the possibility of more Asian and American projects and a mission with Unicef in the works. To Choi it’s happiness and contentment. His industry is not particularly predisposed to contentment and happiness, I counter, so how does he balance it? “Part of my job is to achieve balance. Alongside being able to face God at the very end, to know I have made him happy and to have helped those in need, I think it’s to be positive.